12 August 2014: Local government in the Republic of Ireland predates its national political structures, with the constitutional arrangements laid down under British rule in the late nineteenth century remaining in place. Ireland’s local government arrangements consisted until recently of 29 county and county borough councils with a set of smaller town and in some cases borough councils at the sub-tier. A big bang reorganisation in 2014 saw this number streamlined and flattened into 31 all-purpose local authorities through a series of mergers, in response to Ireland’s recent economic and political crisis. Both the Republic of Ireland (pop. 4.5m) and the Island of Ireland itself (including the British-governed province of Ulster) are considered to be geographically part of the British Isles but this has more currency in considering Europe’s geographical make-up than in political terms, for a variety of reasons. Among those in the Republic who resent the term ‘British’ the neutral term is ‘Islands of the North Atlantic’, though this has yet to gain widespread acceptance. The history between Ireland and its neighbour in the form of the United Kingdom has been characterised by a number of invasions and wars, with legal incorporation beginning in 1801 with the Act of Union and ending in 1920 with the Government of Ireland Act, which saw the 26 counties of the Catholic south secede from the United Kingdom to leave the six counties of the Protestant north in place. Within the Island of Ireland itself, 4.1m are resident in the Republic and 1.7m live in the United Kingdom province of Ulster. Since the peace process brokered in the late 1990s, a number of North-South political institutions have been created and laws exist to accord political rights north and south of the border to all citizens of the island. Ireland makes much of its Christian heritage and the role of religion is central to many people’s lives throughout the country. In the 1990s, after decades of a sluggish economy, Ireland enjoyed an unparalleled economic boom and rebranded itself as a ‘Celtic Tiger’. Tourism plays a major role in the national economy, both rural and in the capital Dublin while agriculture plays an important role. Ireland also enjoys a vibrant cultural life and heritage. The Island of Ireland is divided into four traditional provinces, Connacht, Leinster, Munster and Ulster. These are further divided into 32 historic counties throughout the island, with six remaining north of the border in Northern Ireland (UK). Six counties of the nine counties of Ulster are in Northern Ireland, with three remaining in the Republic, thus rendering the term Ulster politically inaccurate if used to denote political boundaries. The four provinces have no administrative structure, either in the Republic or Northern Ireland. In the Republic the 26 counties are reflected in its administrative counties, except in Dublin. In Northern Ireland the remaining six counties are defunct in local government terms, with 11 district councils existing in the province (also subject to reorganisation in 2014, down from 26), though the six counties are used for some civil service functions under the direction of its political institutions. Dublin has long served as the Irish capital since the island was divided into tribal kingdoms. The city of Dublin has a population of 495,000, though the metropolitan area including surrounding counties is estimated at 1.6m. Dublin City Council (known as the Dublin Corporation until 2002) is presided over by the Lord Mayor of Dublin, a ceremonial post appointed to from among the city's 52 assembly members. Executive power currently resides with an appointed city manager, who oversees a staff of 6,000 city officials and employees. The city is twinned with Barcelona, Liverpool and San Jose, California. Outside of Dublin, a varied pattern of local government existed. Local government in the Republic owes its genesis to the Local Government (Ireland) Act of 1898, which was actually passed by the United Kingdom’s Parliament at Westminster with the aim of reforming Irish councils along the lines of those recently created on the mainland. This ushered in a two-tier system for most of the island, with all-purpose county boroughs in large urban centres. Subsequent legislation passed by the Irish Parliament has amended this Act but it remains in force today, in addition to the recognition of local government’s status in the Constitution of Ireland, as amended in 1999. Instead of the 26 historic counties of the south, local government in the Republic was subdivided into 29 administrative counties, with 24 of the historic counties being reflected by an elected county council. Dublin is further divided into three counties while Tipperary was divided into North and South. There are five cities in the Republic, each with their own city council, Dublin, Cork, Galway, Limerick and Waterford. The five city councils were considered as having the same power and status as the counties. A sub-tier generally known as town councils also existed, though five (including the city of Kilkenny) styled themselves borough councils. Local government in Ireland has seen a steady erosion of its powers since 1945, with a number of functions passing to central government-appointed boards. Like the city manager in Dublin, each council has an official manager (since 2014, chief executive), who carries out many tasks ordinarily reserved for political leaders elsewhere in European local government. Though the pattern of local authorities in Ireland is complex and uneven, the role of local government itself corresponds to a general model of local administration, with locally-elected councils working within a policy framework determined by the centre. Therefore the elected element merely provides for minor local variance to such policies and the cover of local democracy within a highly centralised system. Principally, Irish local authorities exercise limited jurisdiction over education, health, housing, roads, water supply services, sewerage and waste, local economic development, planning, environmental protection, culture and sport and agriculture. A review of local government in Ireland commissioned by central government and reporting in 2006, recommended some fiscal reforms to allow for local revenue raising and more autonomy in local service provision, but this was ultimately rejected by central government. Local government in Ireland is overseen by the Department of the Environment, Community and Local Government, with civil service responsibility residing with the Department of Environment, Heritage and Local Government. The minister between 1997 and 2002, Noel Dempsey of Fianna Fail, was seen as a reforming minister and oversaw substantial changes, including constitutional recognition of local councils and the introduction of public service reforms. His successor, John Gormley, was known for his keenness to devolve more powers to local councils and introduce elected mayors, including a powerful metropolitan authority for Greater Dublin headed by an elected mayor. Gormley, a Green and a former Lord Mayor of Dublin, entered government in 2007 as part of the Fianna Fail-led coalition, which introduced an unsuccessful bill to legislate for an elected mayor of Dublin. The Fine Gael/Labour coalition elected in March 2011 stated its intent to introduce an elected mayor of Dublin by 2014, alongside the possibility of elected mayors for other Irish local authorities to replace council managers as part of a shake-up of Ireland's creaking and inefficient century-old system. In October 2012 the environment and local government minister Phil Hogan announced the details of its reform package, to merge 114 local authorities into a more streamlined structure of 31 all-purpose counties and districts (councillors elected simultaneously to counties and smaller municipal districts), reduce the number of councillors to just 949, introduce a new local property tax and allow for a referendum on a Dublin city mayor in 2014. The referendum plan failed to progress however as the 2014 law to provide for its staging required consensus across all four Dublin authorities before any public vote could be held, with one council vetoing the proposal in March 2014. The newly elected and constituted Dublin councils may later agree to hold a referendum however. All councils are elected to by proportional representation and councillors generally belong to one of the Republic’s main political parties. Most political parties in Ireland, north and south, owe their origins to either the Irish civil war or sectarian religious considerations. For instance, Fianna Fail and Fine Gael represented different sides in the civil war of 1922-23. Catholic-led Sinn Fein, which aims for a united Ireland, organises throughout the 32 counties, while the Democratic Unionist Party does not. Dublin City Hall, originally the Royal Exchange, was built between 1769 and 1779 and is a particularly fine example of 18th century architecture. Located at the top of Parliament Street on the city's south side, it stands next to Dublin Castle, the location of British government in Ireland until 1922. City government had originally been located in the mediæval Tholstel one quarter of a mile away. 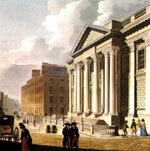 In the 1850s, the City Corporation bought the Royal Exchange and converted it for use by city government. The building was restored to its eighteenth century appearance at the beginning of the twenty-first century. Most Dublin Corporation staff are located in the new and controversial Civic Offices, built on the site of a national monument, the Viking city foundations on Wood Quay. 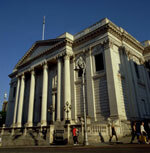 Dublin Corporation itself was renamed in the late 1990s as Dublin City Council. Council meetings take place in City Hall.